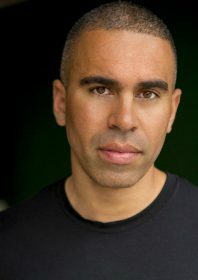 Biography: Joey Ansah was born in Hammersmith, London, UK, in 1982, to parents Nicola Ansah from Plymouth, Devon, and the famous Ghanian fashion designer, Kofi Ansah. His uncle is the African filmmaker, Kwaw Ansah, and his older brother is the musician, Ryan Ansah. Joey grew up in Streatham, South London, and attended Oakfield School and later Dulwich College. His interests growing up included acting – which saw him take part in many school productions – and martial arts films. At the age of 10, the Ansah family emigrated to Accra, Ghana, where he attended an international school for five years. While living in Ghana, Joey started training in taekwondo, and also became involved in hip-hop dancing and motorbiking. At the age of 14, Joey moved back to the UK with his mother and one-year old sister, Tanoa. He attended Devonport High School for Boys in Plymouth. During this time, he started to train in the art of ninjitsu with military personnel. He took up high diving and trained in acrobatics. At the age of 18, he relocated to Oxford where he studied human biology in at Oxford Brookes University. Whilst in Oxford, Joey started to study the Brazilian martial art of Capoeira. He also spent time working as an extra in film, TV and commercials. He also worked as a model and started to become involved in stunt work. He worked as a shadow warrior on Batman Begins (2005) and acted as a fight trainer and choreographer on the sci-fi series, Starhyke. At the age of 21, Joey relocated to London where he landed a role in the award-winning indie film, Lovestruck (2005). He started to pursue a career in acting, appearing in the UK TV show, Spooks (2005), and the docuseries, Timewatch (2006). He also started working on UK action films as both an actor and fight choreographer, including Ross Boyask’s Left for Dead (2005), and the martial arts film, Underground (2007). His Hollywood break arrived when he played an assassin in Paul Greengrass’ hit sequel, The Bourne Ultimatum (2007), in which he had a fight scene with Matt Damon. The fight scene was nominated for an MTV Film Award in 2008. His other notable acting credits include Attack the Block (2011), Snow White and the Huntsman (2012), and the Scott Adkins film, Green Street 3: Never Back Down (2013). In 2010, Joey co-directed, wrote and starred in a short fan film based on the Capcom computer game, Street Fighter, centred around the story of the Ken and Ryu characters. Street Fighter: Legacy was an internet hit and Joey set about working on a Street Fighter web series, alongside his Legacy collaborator, Christian Howard. Following endorsement from Capcom, Street Fighter: Assassin’s Fist was launched as a Kickstarter campaign, but the crowdsourcing was cancelled in 2013 when the project received finance from private backers. The series was directed and co-written by Ansah, who also reprised his role as the villain, Akuma. The series was initially released in 12 separate episodes on the video streaming platform, YouTube, and a film version was released in 2015. The film is widely regarded as the best film adaptation of the Street Fighter video game. In 2016, Joey and Christian returned to the Ken and Ryu story in the sequel, Street Fighter: Resurrection, which was also released as a web series. In 2018, Joey appeared in the action-packed sequel Mission: Impossible – Fallout, starring Tom Cruise, and the live-action adaptation of Aladdin, directed by Guy Ritchie. Speech! “This is one of the odd careers… in the acting/filmmaking business, you love to work. Working is the very best thing you can be doing. It’s when you’re not working, the downtime, that can be tough.” In conversation with Kung Fu Movie Guide, 2018. Click here to listen to KFMG Podcast S03 Episode 29 with Joey Ansah. Filmography (as actor): 2005 Batman Begins; Left for Dead; MI-5 (TV); Love Struck; 2006 Timewatch (TV); 2007 Voyage: Killing Brigitte Nielsen; The Bourne Ultimatum; Underground; 2008 Doctors (TV); 2009 Cell: Season 2 (TV); Ghost Town; Starhyke (TV); 2010 Street Fighter: Legacy (short); Knock Out; Dragon Soccer (short); 2011 Attack the Block; Crysis 2 (voice; video game); Benidorm (TV); Hit Girls (short); 2012 I, Anna; Snow White and the Huntsman; Spec Ops: The Line (performance capture; video game); Alien Uprising; AfterGlow (short); 2013 The Numbers Station; Green Street 3: Never Back Down; 2014 Born of War; Street Fighter: Assassin’s Fist; 2016 Beowulf: Return to the Shieldlands (TV); Seer: Death Sight (TV); 2017 How to Talk to Girls at Parties; 2018 Rogue Trooper: The Quartz Massacre (short); Mission: Impossible – Fallout; 2019 The Kid Who Would Be King; Aladdin.